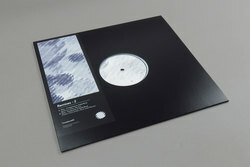 Ploy - Footprints In A Solid Rock (Beatrice Dillon / Peder Mannerfelt Remixes). Vinyl 12. Bleep. Hot on the heels of Ploy’s wonderful Intrigued By The Drum EP, Timedance dig a little deeper into the Bristolian’s catalogue and present two remixes of a track from TIMEDANCE005. Beatrice Dillon’s rework of ‘Footprints in Solid Rock’ takes cues from the original in the way that it eschews the dancefloor and instead burrows down into a different space. Guided by the hi-hats, deep throbs of bass and a hissing minor chord, the track is a woozy and seductive dub. The Peder Mannerfelt remix is rather different, with the Swedish producer turning in a bristling techno cut that is primed for the darkest corners of the mix. It also contains a fantastically obnoxious mid-section. Fine work from all involved and another feather in the Timedance cap.